If you have restless leg syndrome, home remedies are available. Also known as Willis-Ekborn Disease, restless leg syndrome is a disorder characterized by a compelling desire to move the legs when trying to lie down or sit. It’s a condition that can happen at any age or gender, though women experience restless leg syndrome more than men. It is believed that millions of Americans suffer restless leg syndrome each year, but exact numbers are hard to pin down since many people don’t seek treatment for the condition. The good news is that treatment is possible and there are several natural restless leg syndrome home remedies that can be employed. Obviously, the main symptom of restless leg syndrome is restless legs, hence the name. The syndrome has several key elements that help differentiate it from regular restlessness, however. Restlessness is independent: The restless legs happen even if the rest of your body feels tired or exhausted. 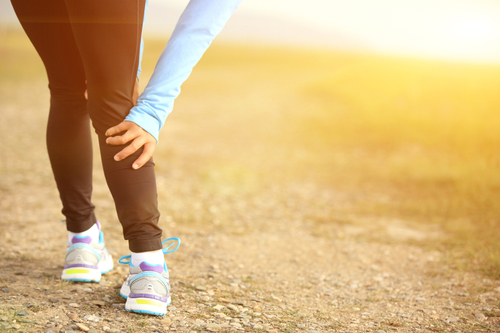 You may feel drained and could even be struggling to keep your eyes open, but your legs seem to flatly disagree. Triggered by rest: The symptoms of restless leg syndrome lessen during movement and usually start when sitting or lying down. Nocturnal symptoms: Restless leg symptoms tend to appear mainly at night and can pose significant sleep disruptions. Additionally, restless leg syndrome is associated with leg twitches and kicks while asleep. Interior sensations: Another main component of restless leg syndrome is the presence of various unpleasant sensations like crawling, creeping, aches, itching, or throbbing coming from the legs or feet. These sensations feel like they are coming from inside your leg rather than on the skin. What Causes Restless Leg Syndrome (RLS)? No one really knows what the causes of restless leg syndrome are. Since restless leg syndrome is known to run in families on occasion, it’s possible that there may be a genetic component and a few possible culprit genes have been identified, but more research is needed. Hormones or other elements of body chemistry may also be at play, since pregnancy is known to worsen or in some cases cause restless leg syndrome until the baby is delivered. One theory is that restless leg syndrome is tied to dopamine, which affects messages that control muscle movement. A strong, often irresistible urge to move the legs that is usually accompanied by uncomfortable sensations. Symptoms start or worsen during periods of rest and are partially relieved by activity. Symptoms cannot be explained solely by another medical or behavioral condition. This often requires other tests as your doctor attempts to rule out other possible candidates. If you have restless leg syndrome, home remedies to treat the symptoms are available–although there is no known cure for restless leg syndrome. Various home remedies and lifestyle adjustments can be used to lessen the symptoms and make periods of rest more tolerable for you and your legs. Some people say that a good restless leg syndrome home remedy is soap—that is, placing a bar of soap under the bed—and others say that drinking tonic water helps restless leg syndrome, but these claims are largely unproven. Here are some restless leg syndrome treatments to try out at home. Caffeine is a stimulant, and stimulation is the last thing restless legs need. This doesn’t work for everyone so try cutting out chocolate, coffee, tea, and other sources for a week or two and see if it makes a difference. If it does, experiment to see how much you can have before things worsen again. Whether it’s yoga, massage, a warm bath, or some other form of stress reduction therapy, it’s important to find a way to relax since stress can worsen the symptoms of restless leg syndrome. Finding ways to maintain calm and avoid stressors can be part of an effective home treatment. Using a warm or cool pack, thick socks, or other methods to adjust the temperature of your legs may help. Some people find that only warm or cool temperatures will treat their symptoms, while others prefer alternating. In addition to soothing your legs, these treatments may also help ease the pain brought on by the condition. Smoking makes you jittery and is a possible cause of insomnia and restlessness in general. And now you can add restless leg syndrome to the list of reasons why you should try ditching the habit. There are some preliminary findings associating restless leg syndrome with low levels of iron or vitamins C, E, and D. It can be worth talking to your doctor about being checked for a deficiency and possibly taking supplements. Alternatively, low-but-not-deficient levels of these nutrients can be compensated for with diet adjustments. If you are on any medications, talk to your doctor about possible side effects that could tie in to your restless leg syndrome. It’s possible that dose adjustments or medication changes may improve your condition. Below are some lifestyle changes you can implement and other home remedies for leg pain to help you manage the condition. The first step is to take measures to improve your quality of sleep. Fatigue can worsen the symptoms of restless leg syndrome and that can cause a bit of a vicious cycle if the symptoms end up disrupting too much of your rest. Try to maintain a cool, quiet, and comfortable sleeping environment and maintain as much consistency as possible in your sleep routine. Moderate, regular exercise can be another way to improve sleep quality and serve as a natural remedy for restless leg syndrome. However, it’s important to do your exercise several hours before you plan on going to bed since working out may exacerbate symptoms if it’s done too late in the day. Restless leg syndrome in and of itself does not lead to other complications, even if left untreated. However, it can sometimes be an indicator of another underlying problem. Nerve damage: Chronic conditions such as diabetes or alcoholism can result in peripheral neuropathy, a type of nerve damage that can lead to restless leg syndrome if it happens in the legs. Iron deficiency: Having a deficient iron level has been linked to either causing or worsening restless leg syndrome. Since iron deficiencies are normally caused by conditions that cause excessive bleeding (e.g., intestinal bleeding) or kidney disorders, it can be worth getting checked out if you have a history of such problems. If you are suffering from restless leg syndrome, home remedies can be utilized to relieve symptoms (even though there is no cure). Make sure to speak with your doctor first before seeking new forms of therapy. Kinman, T., “Home Remedies for Restless Leg Syndrome,” Healthline web site; http://www.healthline.com/health/restless-leg-syndrome/home-remedies-for-rls#Overview1, last accessed March 10, 2016. “Restless Legs Syndrome – Risk Factors,” Mayo Clinic web site, December 10, 2014; http://www.mayoclinic.org/diseases-conditions/restless-legs-syndrome/basics/risk-factors/con-20031101, last accessed March 10, 2016. “Restless Legs Syndrome – Tests and Diagnosis,” Mayo Clinic web site, December 10, 2014; http://www.mayoclinic.org/diseases-conditions/restless-legs-syndrome/basics/tests-diagnosis/con-20031101, last accessed March 10, 2016. “Restless Legs Syndrome – Symptoms, Mayo Clinic web site, December 10, 2014; http://www.mayoclinic.org/diseases-conditions/restless-legs-syndrome/basics/symptoms/con-20031101, last accessed March 10, 2016. “Restless Legs Syndrome – Causes,” Mayo Clinic web site, December 10, 2014; http://www.mayoclinic.org/diseases-conditions/restless-legs-syndrome/basics/causes/con-20031101, last accessed March 10, 2016.